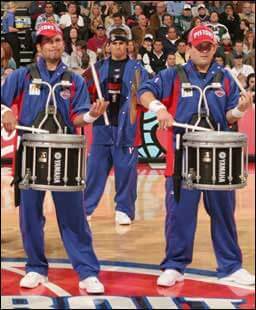 Todd Ohme and the Detroit Pistons drum line participated in the NBA All-Star game festivities this past weekend. Ohme is a tenor drum player who won the 1998 I & E championship (as a member of the Glassmen) and later taught the Crossmen. He sent in this report. The weekend came off very well. We arrived in Houston on Wednesday and started working with the different groups we would be performing with. There were a couple 8 a.m.-to-midnight days in there in order to pull this one off. Friday night was the celebrity game performance. We had pictures with Ice Cube and Nelly and crossed paths with quite a few notables. We performed at two timeouts for that game. Then on Saturday we practiced throughout the morning and then made a televised appearance in the introductions for the three-point shot and dunk contest. Also, later in the night, we performed up on the main stage. We used a big drum rack with 30 drums and cymbals and my club drum configuration (four large toms, marching snare, and bongos) and played to the Blue Man Group song "Drumbone." Sunday was the All-Star game night. We had a performance with the Orlando Magic Jam Skaters and a 6-year-old junior percussionist first, and then ended the night with a drumoff between us and the Dallas Mavericks line. They were cool and we all had a good time with it. The fans applauded heavily for each drumline and the announcer deemed it as a draw. Both lines are competitive by nature, but we each had such a good time with it, and the crowd enjoyed the energy so much, that all was good and we could all walk away from that feeling really good about the performance. So we had a great time down in Houston and are really thankful for the opportunity. Tonight we are headed back to the Palace for a "welcome home" performance at the game against Indiana.